WRIS, Inc. is a web design, development, hosting and search engine optimization company founded in 1996 and based in Cleveland, OH. Since our inception, our primary objective has been to develop practical websites and nurture long-term client relationships. We're committed to understanding your business and goals before we even begin your web design project. This approach helps us deliver a finished product that reflects your message, increases profitability and supports steady growth. We offer content managed sites, ranging from the most basic brochure to the most detailed e-commerce, and everything in between. Contact us today to learn how we can work together! 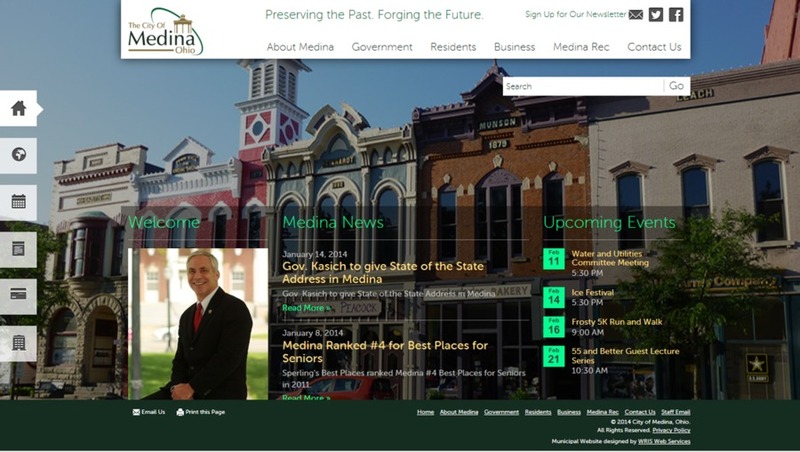 WRIS recently launched a newly built, responsive design website, for the City of Medina, Ohio. The site includes a variety of capabilities and functionalities, allowing for communication with residents and businesses, while also acting as a marketing tool geared towards prospective residents and commercial entities.